Northern NSW Farmers are facing some of the toughest climatic conditions for over 60 years. To their credit they have been preparing and managing through this drought for more than 12 months. But it is tough. 86% of farmers are hand feeding livestock. A quarter of farmers have run out of their own water supplies. Some of the worst affected areas are the New England North West such as Walgett, Berwarannia and Bourke. 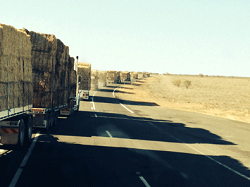 On the 7th February 20 trucks drove a convoy of hay from Burrumbuttock to Bourke to support drought affected farmers. This was organised by southern NSW farmer, Brendan Farrell, who wanted to let these drought affected farmers know that someone cared. He was driven on by the wish to save lives after hearing how bad it is and how one farmer couldn’t take it anymore and was found ‘swinging from a tree’. So Brendan started something special, sending 50 tonnes of hay to Bourke to a street full of people and applause. The We’re For The Bush Appeal began when 2GB came on board after hearing Brendan’s story and wanted to encourage listeners to help raise funds for the fuel cost of $50,000 to transport the hay. This fwas ollowed by CBA, Newscorp, and NSWFarmers joining in and since then over $800,000 has been raised. The donations are going towards the transportation of hay and gift vouchers for food and fodder. Fortunately, for these farmers the Federal Government recently stepped in to offer a relief package and while some areas have seen some rain fall in recent days but this won’t change the situation overnight. Continued support from everyone will help these struggling farmers. It will keep their fighting spirit going knowing that we’re listening to them and giving a damn. Trucks of hay are still heading North with the 2nd Burrumbuttock to Bourke convoy of 43 trucks leaving this week on April 4th. Donations are still very much in need and if you are interested in helping, even a little, please see the information on NSWfarmers website. You can also keep updated with Brendan Farrells Hay Convoy via their facebook page Burrumbuttock to Bourke.